An alpha coyote was out doing her job: keeping an eye on the territory, casually watching dogs and walkers from in the far distance. Coyotes become particularly aware of dogs whose energy and awareness might indicate that they could be a threat to themselves. This coyote is especially aware of dogs which have been antagonistic. She has become acutely aware of the barks, paths and even owner voices associated with these dogs. She watches to assure herself that these dogs remain just “visitors” who will leave the park. Today, when most of the “regular” dogs and walkers had already come and gone, the little coyote stretched big and yawned wide before trotting off to leave the area. And then we heard the loud braying voice of one of the regular walkers yelling at her dog in her usual manner. It was a woman who has shown lots of antagonism towards the coyotes, and whose dog chases the coyotes regularly.The minute we heard that voice from far in the distance, we saw this coyote stop dead in its tracks, turn around and dash right back to its previous lookout where it stood with its eyes glued to this woman and her dog. The coyote watched them until they left for good for the day — about 20 minutes. 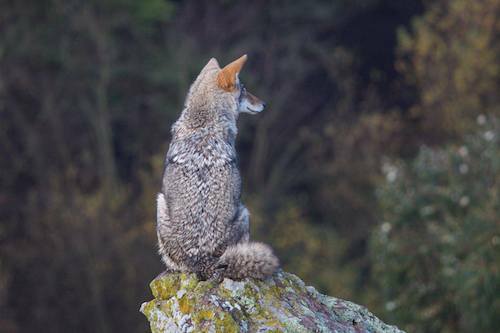 When they were finally gone, the coyote stretched and yawned again before slowly wandering off.